Discussion in 'Contests, DXpeditions and Special Events' started by N3PDT, Feb 7, 2019. Novice Rig Roundup 2019 is right around the corner. March 2, 2019, 00:01 UTC through March 10 2019, 23:59 UTC . Novice Rig Roundup is a fun operating event inspired by the 1950s and 1960s Novice era. While we commemorate the days of 75 watts plate input and crystal frequency control, all are operators and rigs are welcome. So dust off that Knight Kit, DX-35, homebrewed MOPA, or Globe Scout, refresh the filter caps and join the fun. Score is kept for bragging rights only. We do have some cool prizes, including a repro Ameco AC-1 kit, and a brand-new VizKey, that will be awarded by drawing. KE4OH and N6RGR like this. One Week to go! 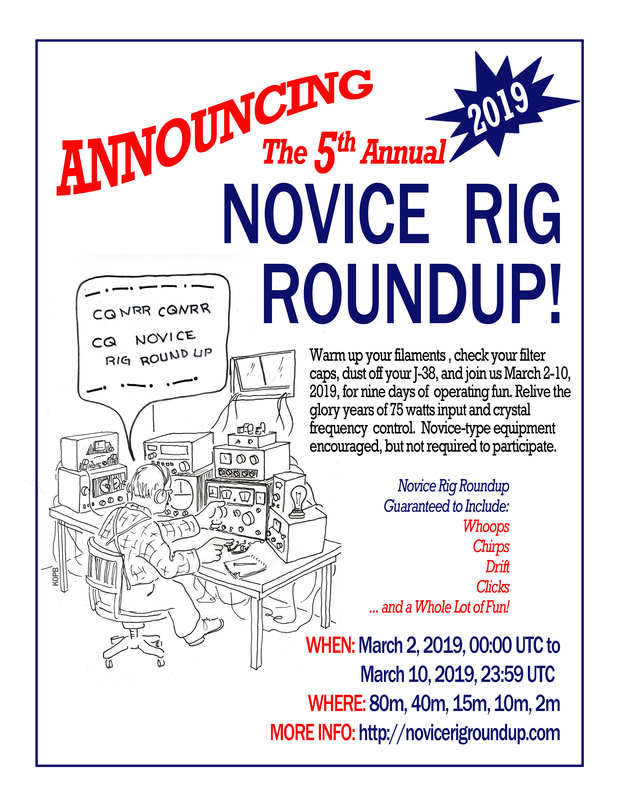 2019 Novice Rig roundup begins March 2, 2019. Hope to hear you then. K5VZD and W5BIB like this.